Some call this promotional coin purse the Kangaroo because of the extra organizer built in. We call it value. zippered back pocket with key ring strap/split nickel ring folds back into the compartment. 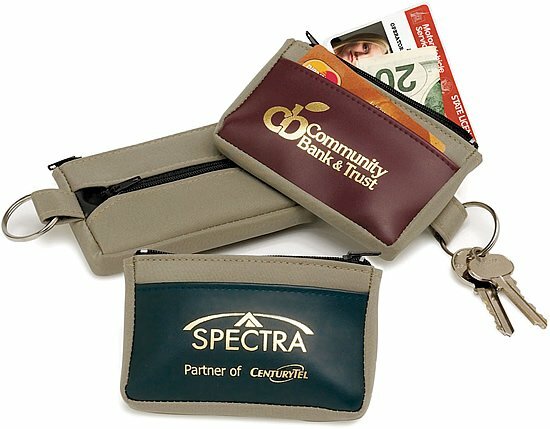 Promotional Three Pocket Coin Purse Colors: Khaki/Navy or Khaki/Burgundy. Overall size of the coin purse is 4 3/4" w x 3" h. Bulk packaged in carton. The price includes gold, silver or white imprint on the front in an area 2 1/2" w x 1 1/4" h.
We will set type for your ad copy in a stock font at no charge. This coin purse has a maximum of a one color imprint.